The voice of experience, the master of control versus a prodigious teenage talent; it is the intriguing contest in the opening round of the Men’s Singles event on Thursday 16th August at the Seamaster 2018 ITTF World Tour Asarel Bulgaria Open. Now 42 years old, Vladimir Samsonov of Belarus, not having enjoyed the best of fortunes on the international scene this year, faces Chinese Taipei’s 16 year old Lin Yun-Ju, a player bang in form; the winner on the second day of action in Panagyurishte of the Under 21 Men’s Singles title. A tough test awaits for the three times European champion, it is the same for the incumbent holder, Frenchman, Emmanuel Lebesson, the no.13 seed, he faces the young man aiming to follow in the footsteps of Vladimir Samsonov and maintain national honour; Aliaksandr Khanin, 20 years old, is the adversary. In the qualification tournament he impressed, as did the Chinese duo of Zeng Peifeng and Ma Te; both are more than capable of causing upsets. Zeng Peifeng faces Liao Cheng-Ting, like Lin Yun-Ju from Chinese Taipei, Ma Te confronts Japan’s Maharu Yoshimura. Opportunities to cause upsets, it is the same for England’s Paul Drinkhall and Liam Pitchford; both face prodigious adversaries but opponents recovering from injury. They have a sniff. Paul Drinkhall confronts Germany’s Dimitrij Ovtcharov, the top seed; Liam Pitchford opposes China’s Ma Long, the reigning Olympic and World champion, the no.3 seed in Panagyurishte. 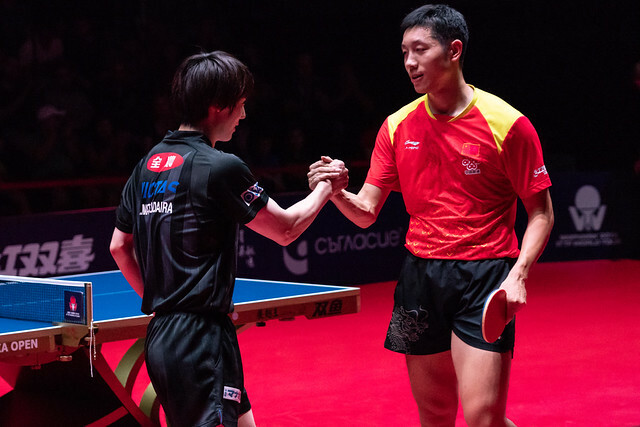 Dimitrij Ovtcharov and Ma Long starts as favourites as do China’s Xu Xin and Japan’s Tomokazu Harimoto; Xu Xin, the no.2 seed following his win in Australia confronts Slovakia’s Wang Yang, Tomokazu Harimoto, the no.4 seed, the winner on home soil in Japan, opposes Korea Republic’s Baek Hogyun. Both start as clear favourites. Likewise, Japan’s Kasumi Ishikawa, the top seed in the Women’s Singles event starts as the favourite against Britt Eerland of the Netherlands but for colleague, Mima Ito, the no.2 seed, a player in fine form awaits. She meets China’s Wang Yidi, the winner in Panagyurishteof the Under 21 Women’s Singles event. An in form player but if two players attracted the attention in the Women’s Singles qualification tournament it was Korea Republic’s Kim Haeyeong and Park Joohyun; both have excelled all expectations. In the opening round, Park Joohyun faces Japan’s Hitomi Sato, the no.4 seed; Kim Haeyeong confronts Hungary’s Georgina Pota, the no.13 seed. Mouth-watering contests but in the Women’s Singles first round, the top pick is the battle of talented left handers, Romania’s Elizabeta Samara, the no.9 seed, versus Chinese qualifier Wen Jia. Both have ITTF World Tour Women’s Singles titles to their name; three for Elizabeta Samara, two for Wen Jia. Furthermore they have won top level ITTF World Tour titles; in 2015 Elizabeta Samara succeeded in Qatar, in 2011 Wen Jia prevaled on home soil in China and two years later in Germany; it is some first round contest.